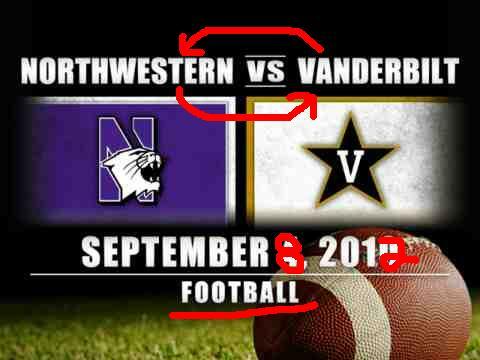 Since Brendan wanted to neither preview nor review the Michigan/Alabama game he attended last weekend, this weekend’s Vanderbilt/Northwestern matchup will be ALDLAND’s first live-covered football game of the season. I, along with CFB preview podcast guest Marcus and VSL‘s Bobby O’Shea, will be in Evanston this weekend for the meeting of these two institutionally similar teams. On Wednesday, Vanderbilt was a 3.5-point favorite on the road, and the line hasn’t moved since. Given the high hopes in Commodore Country James Franklin has built since his arrival before last season and the sense around the Midwest that Northwestern, while not a doormat, has plateaued, this feels a bit narrow. Still, NW will make a formidable host for the visitors, for whom this is an important game they absolutely should win on their way to higher heights back in the SEC. As O’Shea writes in his preview this week, a win in the Chicago suburbs would be a strong statement to the Black & Gold’s national recruiting base as well. As with last year, find us on Twitter during the game, and come back here for a recap afterwards. This entry was posted in ALDLAND and tagged anchor of gold, college football, evanston, northwestern, vanderbilt, vanderbilt sports line by AD. Bookmark the permalink.